Technical progress in the use of warmth for the prevention of hypothermia. 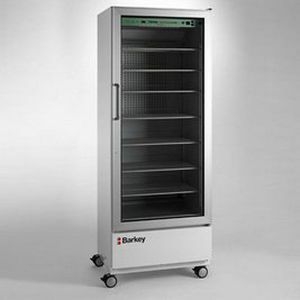 The Barkey warming center III DTM heating cabinet has been specially developed for the pre-warming of infusions, blankets and cloths - e.g. in operating theatre locks (preliminaries). In doing so, the Barkey warming center II DTM supplies mobile heat at any required location in the hospital - safe, reliable and simple to handle. Annoying journeys to centrally-located heating cabinets can now be avoided. The Barkey warming center III DTM is flexible and has been designed to save space. The 4 durable rollers (two of which have a locking brake) ensure additional manoeuvrability and mobility. The use of high-class materials ensures solid quality.